Stop dreading rug messes and learn how to tackle them head on! 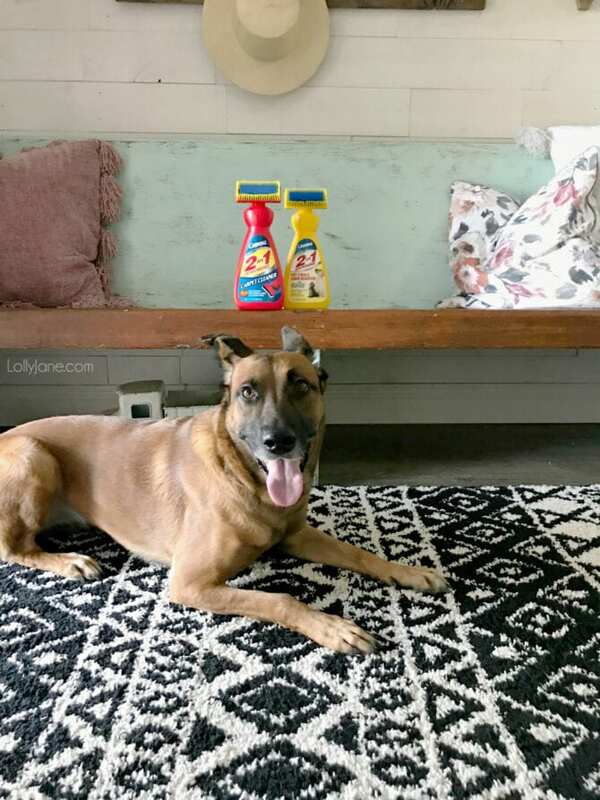 with a few tools in our cleaning arsenal to help rid spots, spills, or stains on our rugs, we no longer worry about daily what-if’s happening on them but are simply enjoying the moments! Let’s talk about pets… your fur babies that are to be seen and not smelled, am I right? We live with a city owned trained police dog who is under a strict diet. Like, a measured amount of a fancy organic specialized blend only and no treats, no exceptions, type diet. Because Hannah, our sweet Belgian Malinois, is the face of the K9 unit for our city, she attends a lot of fun events at different places throughout our city… including schools with little kids. Can you see where I’m going with this? LOL One tot at the elementary snuck her a piece of chocolate and by the time Hannah walked in after her “shift”, that chocolate was, ahem, “recycled” onto my shag rug. How does one remove a dark stain on white fibers of a shag rug, you wonder? With magic, of course! And by “magic, I mean Carbona’s Oxy-Powered Pet Stain & Odor Remover with Active Foam™ Technology. I just spritzed it over the mess and used the brush applicator to scrub it clean. Voila! No trace of recycled chocolate, in appearance OR smell. Speaking of odors… we adopted a stray cat we named Cleo earlier this year to “mouse” for us on our large property. She is used to being outdoors and definitely prefers it to the inside. We have a cat door that leads to our laundry room she can come in and eat/drink but goes right back out to do her business. Little did we know Cleo came to us pregnant… like, 7 babies later pregnant. I went from a clean laundry room to the occasional dry cat food spill to a cat birthing center, pee pads, litter boxes, and all sorts of rodents and birds being drug in. Uuugh. Can you imagine the smell? I’ll give you a hint: gross. important area rug cleaning step you can take. If a rug is reversible, vacuum both sides. This removes grit and grime that can wear out your rug prematurely so get on top of it, friends! Brush out pet hair: Use a stiff brush to remove the hair, brushing in the direction of the nap of the rug as a vacuum will sometimes leave pet hair behind. Turn rugs every year: The harsh sun + foot traffic can put extra stress on area rugs, simply turn them once or twice a year to even out the wear! Liken this to rotating your cars tires! Shake small area rugs: Take your outside + shake or beat it vigorously to remove dirt and grit. 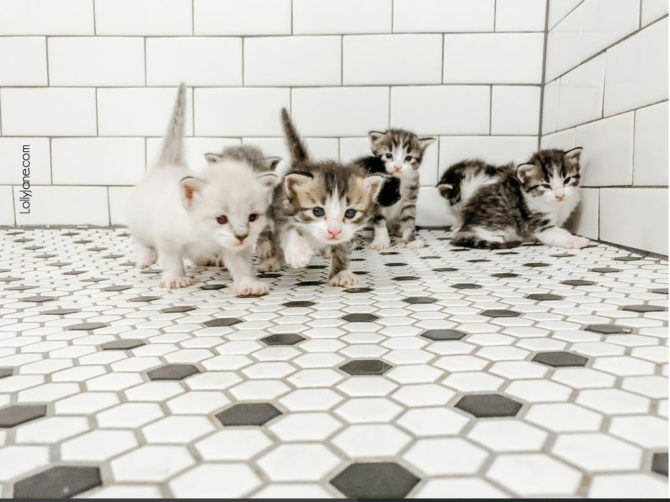 After we found homes for our 7 little darlings, I got to work taking my once-clean and fresh smelling laundry room back. 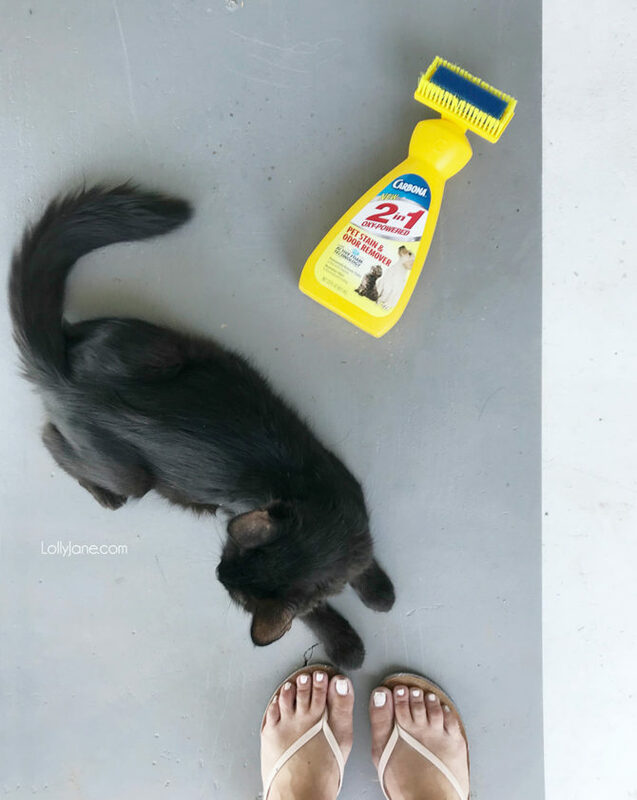 I used Carbona’s Oxy-Powered Pet Stain & Odor Remover with Active Foam™ Technology. I treated the heaviest spots first and, using the built-in brush applicator, they immediately came up… and ever since, no reappearing stains! The foam is kind of fun to watch… it’s like little ninjas are inside beating up the stains for me and breaking them down then leaving a nice fresh scent. 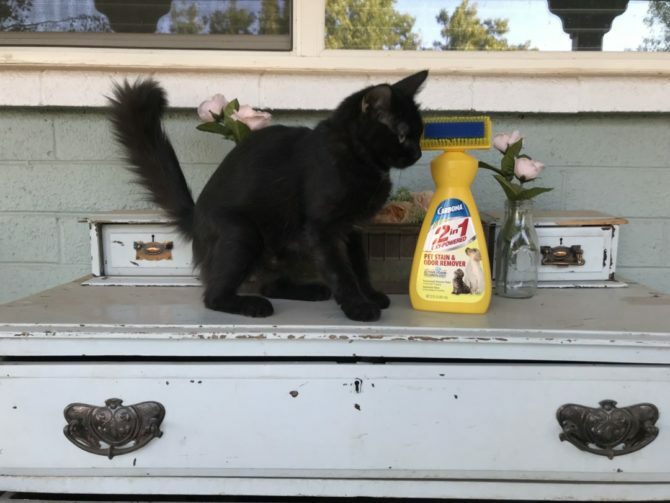 I was able to treat my entire laundry room, which was heavy in cat messes + smells of all shapes in sizes and still had more than half the bottle leftover for future messes. It’s pretty incredible, truly. No pets in your home? No kids? What about a partner or roommate or even (speaking from experience here) just klutzy you? 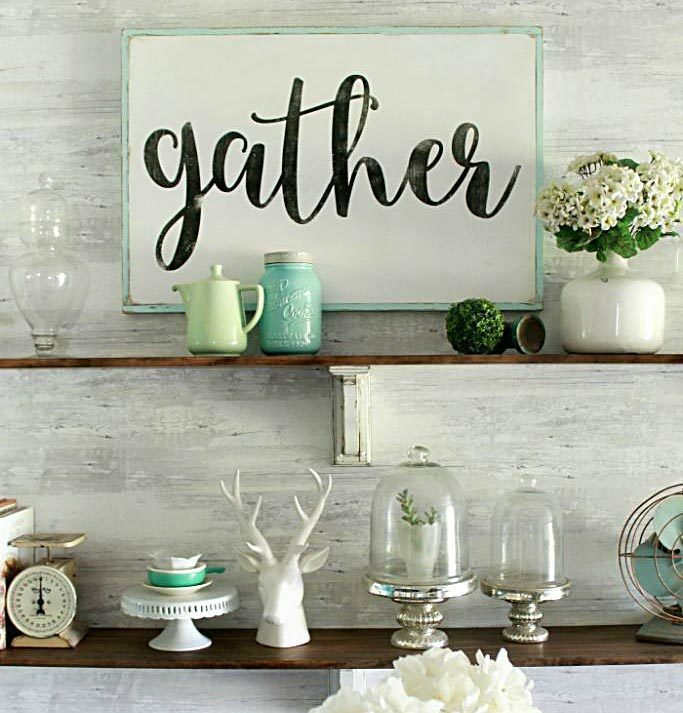 😉 Just last week I was carrying groceries in from the garage and cut through the family room and tripped over the ottoman and my bag of groceries went down… which wouldn’t have been a big deal if I hadn’t had eggs in the bag. Yes, eggs. Ick. Luckily most of the mess was in the carton but one of the yolks seeped out onto my carpet and after I picked myself up and carried the rest of the mess into the kitchen, I headed for my cleaning cabinet and grabbed Carbona’s 2-in-1 Oxy-Powered Carpet Cleaner. Of course there are many carpet cleaners, but why Carbona stands out from the rest is that it permanently removes the stains so they won’t reappear once dried. Have you seen yellow come back? I have and it ain’t pretty on a white rug! Carbona’s Carpet Cleaner is oxy-powered and you can almost SEE the suds working their charm on my rugs and carpet; the built-in brush applicator on the top saves me from touching anything icky… like egg yolk. Ick. 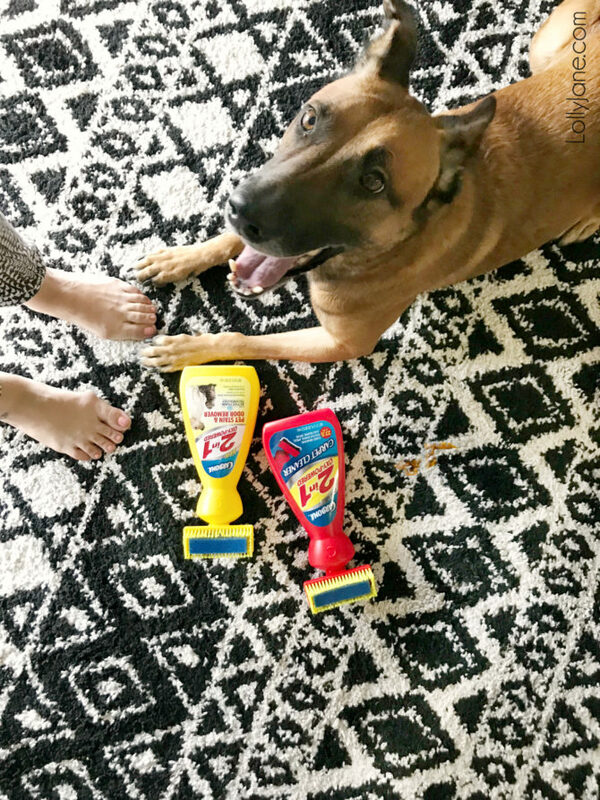 It’s a must-have in any owners arsenal of cleaning supplies, from kids to pets to work boots (I hope my husband is reading this part, haha!) 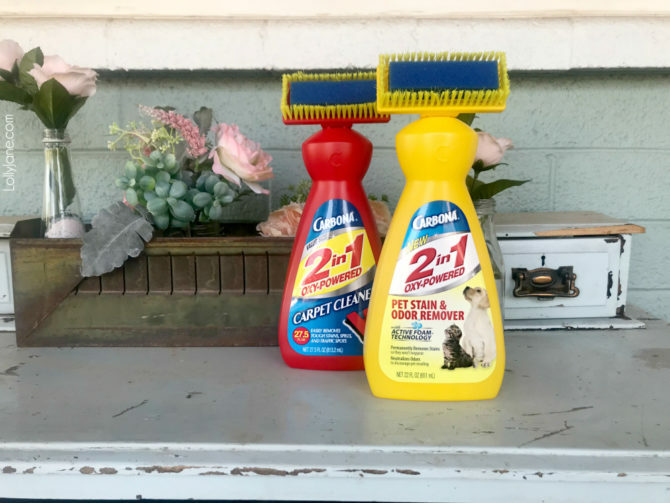 to food spills and everything in between… it has literally saved my rugs from being trashed! Bless you, Carbona! 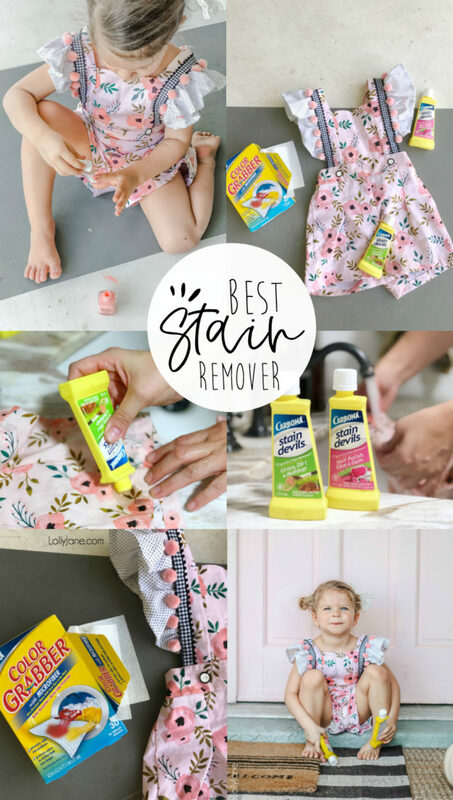 Take a peek at our Carbona post sharing their best ever Stain Remover products or follow along below!